IN STOCK: Organic Almond Extract, Organic Orange Flavour, Organic Lemon Flavour, Organic Peppermint Flavour | *Organic Madagascar Vanilla will be re-stocked by mid-August. 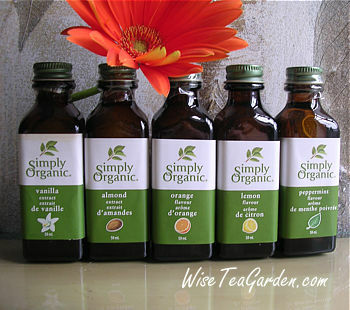 Ingredients, Organic Vanilla Extract: Purified Water, Organic Alcohol, Organic Madagascar Vanilla Bean Extractives. Ingredients, Organic Almond Extract: Purified Water, Organic Alcohol, Glycerin, Natural Bitter Almond Oil. Ingredients, Organic Orange Flavour: Organic Sunflower Oil, Organic Orange Oil Ingredients, Organic Lemon Flavour: Organic Sunflower Oil, Organic Lemon Oil. Ingredients, Organic Peppermint Flavour: Organic Sunflower Oil, Organic Peppermint Oil. Notes:  Please do not substitute dry apricots with fresh ones.  Defrost bananas in advance.  Please don't make Jumbo - this Treat should eaten in tiny or small size! 1. Prepare 12 Unbleached-paper Baking Cups, Small size, or your favourite, and a cavity muffin pan of your choice. Put paper muffin cups in the muffin pan. Preheat oven to 395°C. 2. Remove peel and mesh defrosted bananas with sugar. Beat eggs. Add melted butter and almond extract. Mix well. Cut dried apricots to small strips, add to banana mixture. 3. Combine flour and baking soda. Gently stir into banana-apricot mixture just to moisten. Do not over-mix. Spoon 1 slightly heaped Tbsp into each muffin cup. Bake approx. 15 min until golden and a wooden stick comes clear from the inside of any muffin (no dough on it). Extra: Organic Flour to dust and Nutiva® Organic Coconut Oil to fry. Notes:  Please use only Organic Virgin Coconut Oil to fry. 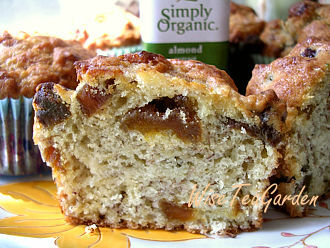  Please never add baking soda or baking powder to this recipe. Beat eggs into cottage cheese, mix well using a fork to make more or less smooth texture. Add sugar and Organic Orange Flavour, beating until combined . Stir flour and a tiny pinch of salt until combined. The dough should be sticky and tender. Do not use extra flour in dough, just 5 Tsp max, otherwise the texture of fritters will be similar to rubber. The main ingredient is pressed dry cottage cheese. 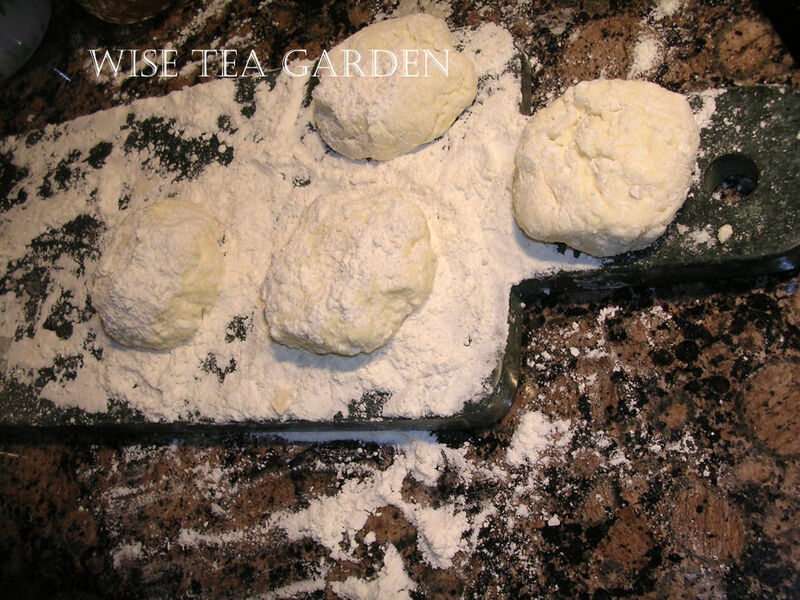 to a small disc » turning each side and cover a fritter with flour so it won't stick to the frying pan. Put 2 Tsp of Organic Coconut Oil on the frying pan. 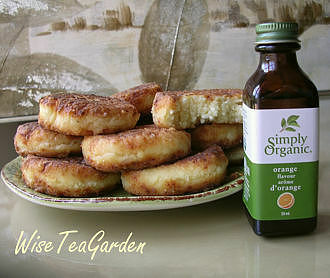 When oil is hot, put fritters into the oil and fry on a light-midium heat turning sides until golden. Remove onto the plate when cooked. Makes 15-16 fritters. Serve warm (cold - tasty as well) with Home-Made Organic Strawberry Jam and Almond Amaretto Biscotti Roobois or Tuscany Pear Rooibos.